The stunning next generation of HT Venue valve amplifiers. All modes are footswitchable, resulting in the widest possible selection of stage accessible valve tones and footswitchable boost on all channels. The supplied 2-way footswitch enables the selection of the Clean and Overdrive channels, and the two voices on each Channel. The optional 5-way footcontroller enables instant access to all channels and voices, plus the global boost function and Reverb switching for maximum control. A switchable power reduction circuit has been included with the HT Venue MkII models giving reliable, transparent attenuation down to 10 percent of the amp’s rated power. This means that the full tonal depth of the EL34 power stage can be enjoyed at any volume, retaining the distinctive sound of power valves working hard, making the HT Venue MkII perfect for any live or recording situation. The simplest way to get valve tone into your recordings. The flexibility of adding a USB connector allows for sending up to 4 channels of the guitar signal, dry, preamp out and stereo emulated out into a computer for recording purposes. Two further outputs on the rear, a stereo jack socket and balanced XLR, also allow the speaker emulated signals to be connected to external devices for practicing, recording or live use. 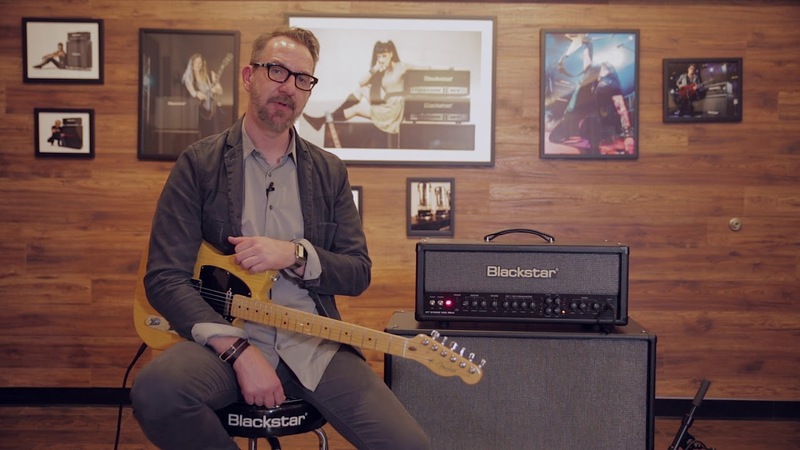 The patented ISF (Infinite Shape Feature) control is unique to Blackstar Amplification and represents a major step forward in tone shaping flexibility. The ISF control shifts the response of the three control tone stack between, a US type response at one end, and at the other, a UK type response. Importantly, in between the two extremes lie an infinite number of alternative tone choices that would be otherwise unavailable. The amplifier features naturally sounding digital reverb that can be adjusted via the Reverb control on the front panel or turned on and off via the optional 5-way footcontroller. A switch on the rear panel selects between ‘Dark’ and ‘Light’. The Dark setting is based on a room reverb and the Light setting is based on a plate reverb. All the HT Venue MkII products have been reengineered to make them more practical and portable. The HT Club 50 MkII offers the same feature set as the HT Club 40 MkII combo in a compact, portable head format. This two channel and 4 voice head with its Power Reduction feature is equally at home in the rehearsal room, studio or club size venue. With the patented ISF control, clean and overdrive channels ranging from 'classic crunch' to 'super saturated lead' the HT Club 50 head truly is the ultimate amp for the gigging guitarist. The flagship HT Stage 100 MkII guitar amp head uses a quartet of selected EL34 power valves to deliver 100W of British dynamics with 3 channels offering 6 voices for amazing tonal versatility. The 'boutique' style clean channel has two modes - 'British Class A' and 'dynamic US'. Each of the two ISF equipped overdrive channels accesses a further two modes. From the studio to the stage the HT Stage 100 MkII is the ultimate amp delivering ground-breaking cleans, rich full overdrives and offering maximum control and flexibility. Can you be without one? The HTV 212 speaker extension cabinet features two 12" speakers.